Summary: A young boy and his sister wake up early while at the beach and are excited about the day ahead. When their parents get up, there are hugs and blessings for all. As the boy and his sister continue on through their day, each action that happens and activity that they do is viewed as a blessing. Blessings are found in the midst of building sand castles and even scraped knees. The story ends as the day closes and the family goes off to bed. Literary elements at work in the story: The theme that runs throughout this story is the primary literary element at work. Through simple words and pictures, the reader is taken on a journey through a day in the life of two young children and all the blessings that come with that day. Each moment in our lives, even the seemingly ordinary ones, are viewed as true blessings. This theme can help young children begin to understand that each day we are given is a gift from God. The people who are illustrated in this book are Caucasian but in this case I don’t believe their race in any way takes away from the message of this story. The message would still be there no matter the race of the people in the illustrations. Theology: We are blessed through Jesus Christ. God provides abundant blessings. God has created each day that we might rejoice in it. How can a freckle on you’re your toes, or your little button nose be a blessing? Why do you think that things like shells, sand, and water can be seen as blessings? How can you find a blessing in times of tears? How can doing chores or work be a blessing to you? 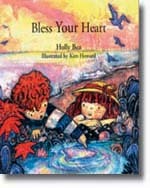 What do you think the author means near the end of the story when she says “bless your special inner light”? Bless Your Heart by Storypath is licensed under a Creative Commons Attribution-NonCommercial 4.0 International License.